So much inspiration, wonder and chatting with like-minded souls – exhausting! There were plenty of highlights but if I had to name just one it would have to be the performance of ‘One small word’ by M6 Theatre Company. A sensitive,well observed portrayal of the ups & downs of child friendships…..and so much more – Magical! 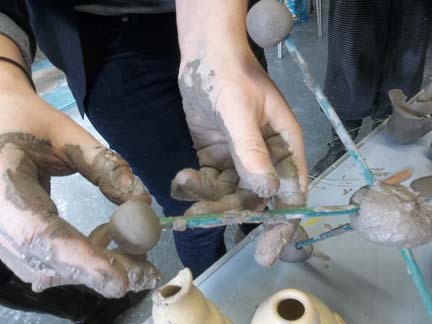 Thanks to ﻿Earlyarts, moonbeams3, and MACfor putting on a brilliant event….and thank you to the lovely people who attended my clay workshopon the Wednesday. Such creative making in so little time. Oh muddyducks!! It was my final http://moonbeams3.com/ stint at the Midlands Arts Centre last week and the land art mud sculptures hadn’t fared too well since I’d last seen them. Once everybody had had a ride on the horseducks, we settled into making clay sea creatures to adorn the mud boat. I’ve thoroughly enjoyed my ten days working on @moonbeams_3 this Summer. The first five sessions were spent indoors as a ‘pop-up potter’ working with early years groups and individuals on the potter’s wheel. 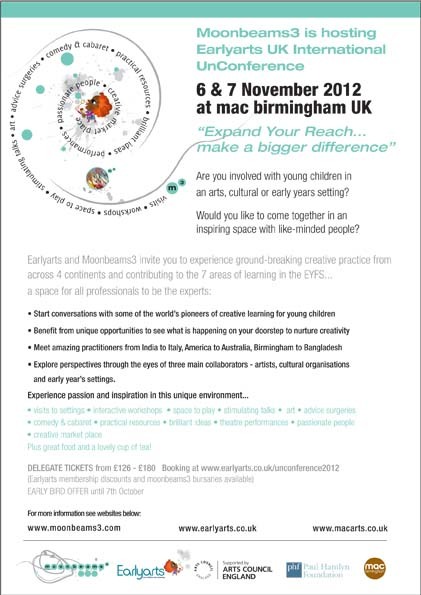 One week I’d be in the hub, the following in the cafe area assisting very young artists with their clay making. 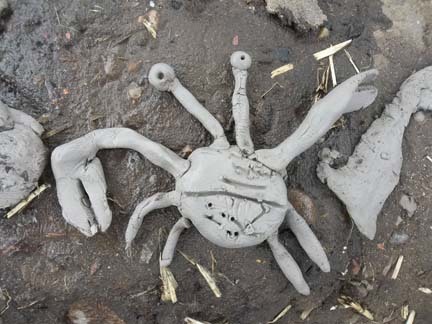 The arrival of the the school holidays heralded a new, even more messier approach – namely mud sculpture outside on the terrace. The young people worked alongside their significant adults and the collaborative atmosphere has been alive with animated conversation. 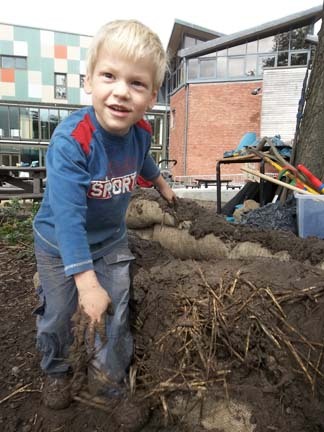 So many benefits for language development, social interaction and hands on, learning about natural materials. Oh, we had a shed load of fun too! Some structural repair to muddy duck No.3 taking place at the Midlands Arts Centre in Birmingham. We’re averaging a duck a day on our moonbeams3 mud sculpture drop-in project with well over 300 young children and their families taking part so far. 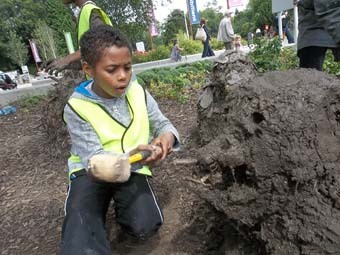 We’ve ordered another ton of mud and intend to build a mud boat on the 7th and 22nd of August.